Soldering has been a primary method of establishing mechanical and electrical connections in electronics for many years and will likely be used in this fashion in the future. While there are several physical properties and characteristics of solders that are of interest to the electronics community at large, one of the most significant physical properties to a thermal engineer is thermal conductivity. Historically, alloys of tin (Sn) and lead (Pb) have been the primary solders of choice. By the time this article is published, the July 1, 2006 date for European compliance with the Restrictions on Hazardous Substances (RoHS) Directive will have passed and the electronics community will be further down the path towards lead-free. The need to develop lead free solders has led to several candidate alloys, but obtaining thermal conductivity data on these alloys is difficult, especially so for well-documented data. The need to build products in a sequential manner has led to classifying solders that are used for die attachment as first level interconnect solders. Solders used for attaching packaged components to circuit boards are classified as second level interconnects and have melt temperatures lower than the first level interconnect solders so that the packaged parts can be attached without reflowing the die attach solder. 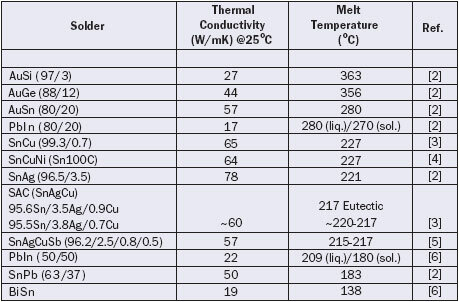 Table 1 lists the thermal conductivity of several solders listed in order of decreasing melting temperature. The solders with just one melting temperature listed are eutectic alloys. The first column lists the constituent elements with the percentage of each element listed in parentheses. It should be noted that elements that constitute up to 5% of an alloy may vary by up to � 0.2%, while elements that constitute greater than 5% of an alloy may vary by up to � 0.5% . Solders listed at the top of the table with high melting temperatures are often used for die attachment in hermetic packages. 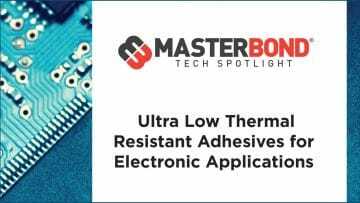 Attachment with these higher melting point solders typically requires the use of substrate materials with a coefficient of thermal expansion closely matched to the semiconductor to avoid excessive stresses when the assembly cools down. Gold-tin eutectic solder is one commonly used die attach solder, which has many favorable attributes but is comparatively expensive. A candidate to replace tin-lead (SnPb) solder is an alloy of tin (Sn), silver (Ag), and copper (Cu) termed SAC. Several variations of this alloy are available but the conductivity for all of them is approximately 60 W/mK at 25°C. Some data may be found with the disclaimer that it is an estimated value, but no details are given on the estimation method. It should be noted that using a “rule of mixtures” for estimating the thermal conductivity of a solder based on the pure thermal conductivity of the constituent element metals can lead to significant errors. For example, the thermal conductivity of AuSn (80/20) solder is 57 W/mK which is lower than the conductivity of either of the parent metals of gold (315 W/mK) or tin (66 W/mK). A final note of caution when using these values in thermal modeling is that the presence of voids, if any, must be considered. IPC-J-STD-006 Test Methods Manual, www.ipc.org. King, J. A., “Material Handbook for Hybrid Microelectronics,” Artec House, Norwood, MA, 1988. Bilek, J., et al., “Thermal Conductivity of Molten Lead Free Solders,” European Microelectronics and Packaging Symposium, June 2004, Czech Republic. AIM product data sheet, www.aimsolder.com. Seelig, K. and Suraski, D., “The Status of Lead-Free Solder Alloys,” Proceedings of the 50th IEEE 2000 Electronic Components and Technology Conference, May 2000, Las Vegas, NV. Indium Corporation product data sheet, www.indium.com. who knows about a compilation of electric conductivities of solder material?